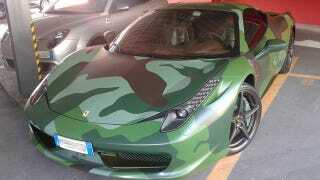 Few would accuse anyone who drives a super car like the Ferrari 458 of wanting to blend into the crowd. It is perhaps only appropriate then that covering a 458 with camouflage inside and out serves to make the already attention grabbing car stick out even more. To us, nothing quite says "maybe I should have bought a military surplus diesel K5 Blazer" like making the decision to camouflage your brand new Ferrari 458. Even if we are alone in that particular sentiment, it's hard to argue with how ridiculous an Italian supercar looks covered in camo. Everywhere you look on this car from the engine compartment to the brake calipers, if there is something that could be covered in camouflage, it is. The good news is that the exterior treatment—complete with peace signs where there were once Ferrari badges—appears to be plastic wrapped, not painted. According to GTspirit, where we came across the latest example of bad choices in supercar modification, this 458 belongs to Lapo Elkann, who is currently the manager of brand promotion at Fiat Automobiles. Elkann's father was the CEO of Fiat until his death and Lapo is widely thought to be next in line to fill the position. If this 458 is any indication, look forward to a camouflage option being available on every new Fiat product as soon as he takes over.